This is it, guys. The end of November. 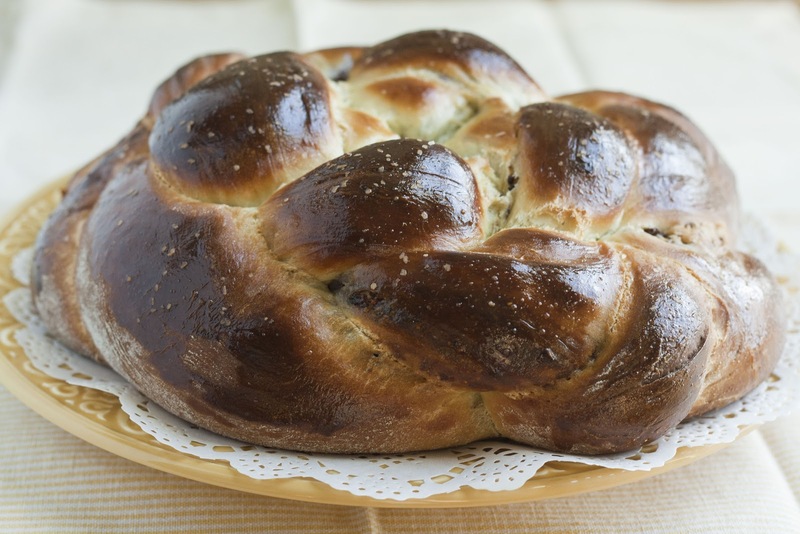 The end of alleged "bread month" on my blog. And how many bread recipes did I post this month? One. Yep, one. So I'm going to say something that's probably going to cost me a lot of readers. I've never been Smitten Kitchen's biggest fan. Blasphemy, I know, considering Deb, the blogger behind Smitten Kitchen, is considered a god amongst food bloggers. But truth be told, I always thought she was a bit, well, overrated. 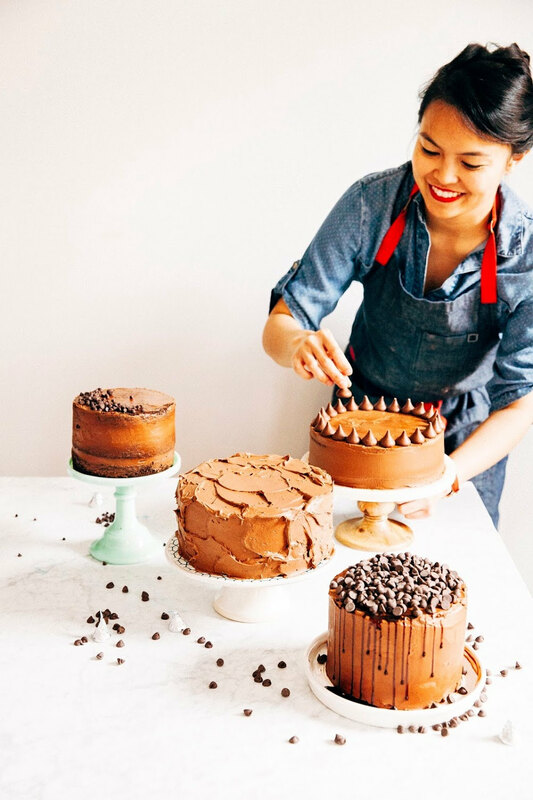 Looking at smittenkitchen.com, nothing really stands out to me as incredible — I mean, don't get me wrong... the pictures, her recipes, her blog design — all of it is fine. But that's just it. Everything is simply that. Fine. Dare I say... average? In the golden age of bloggers and beautiful home-taught photographers (like Tartelette or Roost or Cannelle et Vanille or What Katie Ate), why is Smitten Kitchen the one blog getting all the credit? But then I had the opportunity to hear Deb speak at Powell's, a local Portland bookstore. And that was when it (realization? understanding?) ran me over like a garbage truck — she was so warm, funny, and gracious, it was impossible to dislike her. Despite my initial skepticism, I was charmed. So I went home that night and read through her recipes and anecdotes. Flipping through her blog, I realized that warmth and kindness she radiated in person shines through in all her posts, something that is incredibly hard to do. I have to admire her for that. I also came to the bizarre realization that I hadn't ever really cooked anything from Smitten Kitchen. Here I was, holding a grudge, and I didn't even really have much basis for it. Deb gets a lot of credit for testing, testing and testing recipes until they're perfect and foolproof. So if that's the case, how would her recipe for challah fare? 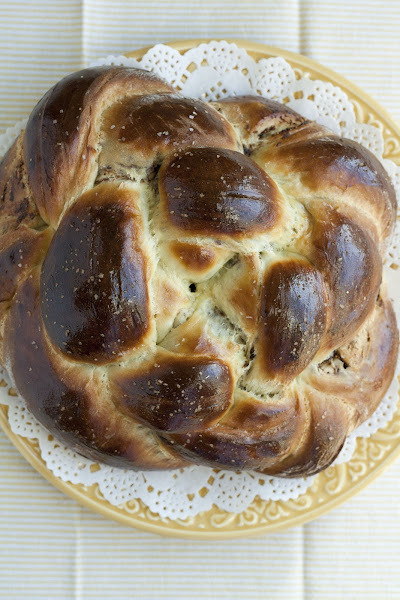 As for weaving the challah braid itself, Deb includes step-by-step photos that make the process go by so much easier. Believe me, I'm not a craftsman at all — I don't know how to knit, sew, and I've certainly got no eye for patterns. To wit, last year, I took a hat-weaving class for kids (yep, it's a long story) and all the seven-year-olds in the class (yep, I was the only one above the age of 7 in the class) were able to weave their hats easily while the instructor spent most of his time walking me through the motions over and over again (and yep, my hat was still the worst one in the class). So yep, I get it now. I now know why everybody loves Smitten Kitchen and Deb Perelman. She's not a god, no no no — it's just that her truly foolproof, anybody-can-do-this recipes produce delicious and beautiful results that make you feel like a god. Or at least, that's certainly how I felt when I pulled this beautiful loaf out of the oven. Like a god. Of bread. I'm posting the recipe here, but you should really head over to her blog (or buy her cookbook) for step-by-step pictures of the challah weaving process. Because in Smitten Kitchen, I trust. In the bowl of a freestanding electric mixer, whisk 2 1/4 teaspoons active dry yeast and 1 teaspoon honey with 2/3 cup warm water and let stand for a few minutes until foamy. Once foamy, add the remaining 1/4 cup honey, 1/3 cup olive oil, and 2 eggs. Add 2 teaspoons salt and 4 cups flour and use the paddle attachment to mix all the ingredients together until a dough is formed and begins to hold together. At this point, switch to a dough hook attachment and run at low speed for 5 to 8 minutes until a smooth and elastic dough is formed. When the dough is finished kneading, transfer to an olive oil-coated bowl, cover with plastic wrap and set aside in a warm place for 1 hour, or until almost doubled in size. While the dough is proofing, make the fig filling. In a medium saucepan, combine 1 cup dried figs, 1/4 teaspoon orange zest, 1/2 cup water, 1/4 cup orange juice, 1/8 teaspoon salt, and a few grinds of black pepper. Bring to a simmer over medium heat and cook, stirring occasionally, until the figs are soft and tender (about 10 minutes). Remove from heat, and let cool to lukewarm. Process fig mixture until it resembles a fine paste, scraping down the sides of the bowl as necessary. Set aside to cool. After your dough has risen, turn it out onto a clean, floured counter and use a dough scraper to divide it into two even halves. Roll the first half of the dough into a wide rectangular shape and spread half the fig filling evenly over the dough, stopping short of the edge. Starting from the longer edge of the rectangle, roll the dough into a long and tight log, trapping the fig filling within. Then, gently stretch the log to as wide as it feels comfortable (mine was around three feet long) and divide it in half. Set these two smaller logs (ropes) aside. Repeat with the remaining dough and fig filling, ultimately ending up with four ropes. (I highly suggest heading over to Smitten Kitchen for this step:) Arrange two ropes in each direction, perpendicular to each other, like a tight tic-tac-toe board. Weave them so that one side is over, and the other is under where they meet. Now you've got an eight-legged octopus. Take the four legs that come from underneath the center, and move them over the leg to their right, jumping over that piece of rope. Take the legs that were on the right and again, jump over each leg before, this time to the left. Continue to do so until you run out of rope. Tuck the corners or odd bumps under the dough with the sides of your hand to form a round. Transfer the dough to a parchment-covered heavy baking sheet. 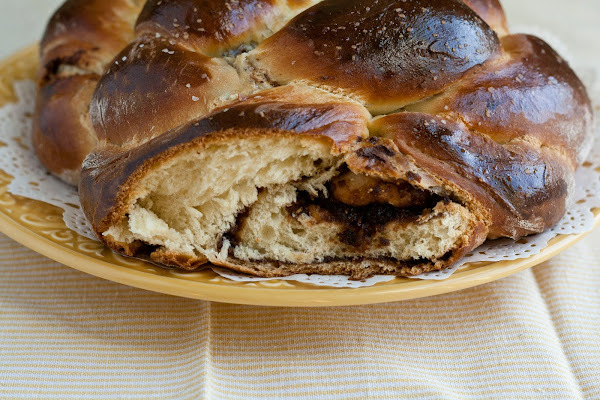 Beat one egg until smooth, and brush over the braided challah loaf. Let the challah rise for another hour, but 45 minutes into this rise, preheat the oven to 375 (F). Before baking, brush the loaf one more time with egg wash and sprinkle with coarse salt. Bake in the middle of the oven for 35 - 40 minutes. If the bread starts to brown too quickly, cover with foil for the remainder of the baking time. When the loaf is ready, an instant-read thermometer inserted into the center of the bread should read 195 (F). Cool loaf on a cooling rack before serving. Great post! I know what you mean - not about Smitten Kitchen specifically, but there are so many great, beautiful food blogs out there and it seems like a small handful get all the attention. Lately I've been ignoring the big guns and trying to give more love to the little guys. Did you buy Deb's cookbook? Is it worth it? 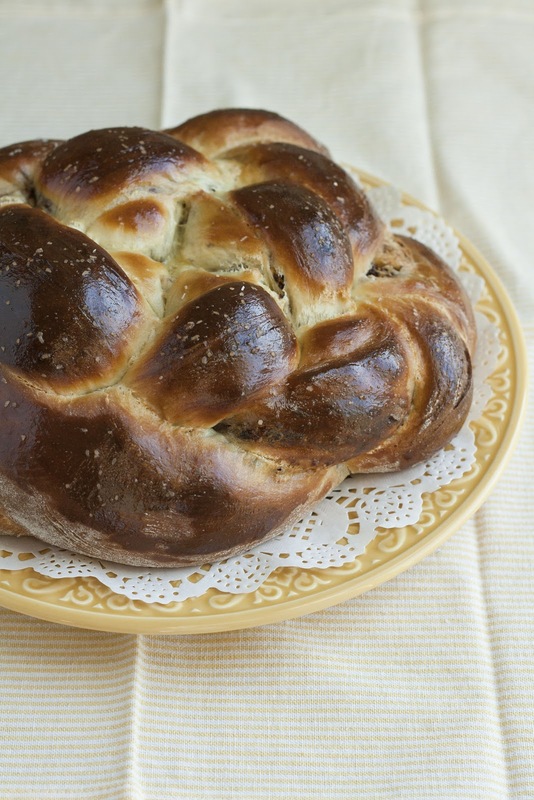 This bread recipe looked scary to me on SK, but maybe I'll give it a go! Thanks for posting the recipe! I know, I agree entirely. Which other, smaller blogs have you been checking out? I'm a big fan of A Pastry Affair (www.pastryaffair.com). 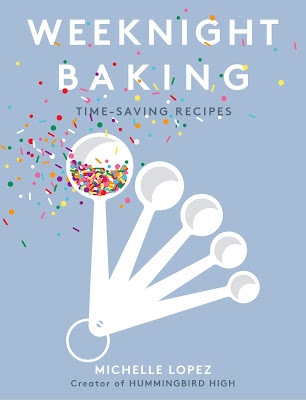 As for The Smitten Kitchen Cookbook, it's fine, but I wouldn't say it's worth it. I bought it at the same time I bought a bunch of other blogger's books -- specifically, Sprinkle Bakes, What Katie Ate, and Small Plates and Sweet Treats -- and I have to say I was so much more impressed with the other books than SK's. SK's looks like somebody just printed out her blog, whereas the other bloggers made more of an effort with their books. I'd say you're probably fine sticking with SK's blog alone. Wow, those are lovely. 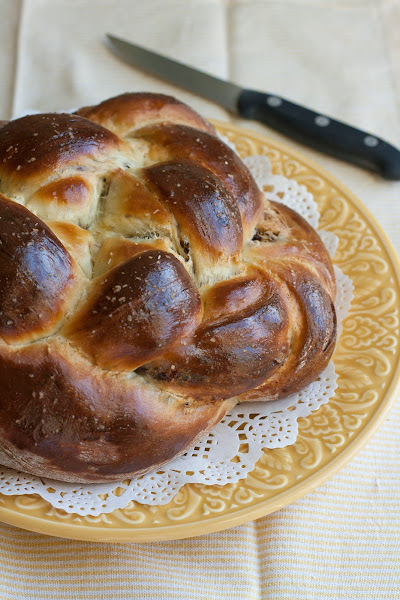 I just admire the artistry of breads like challah so much! Always seemed so hard to get them to rise. I don't eat grains anymore, but they are pretty! 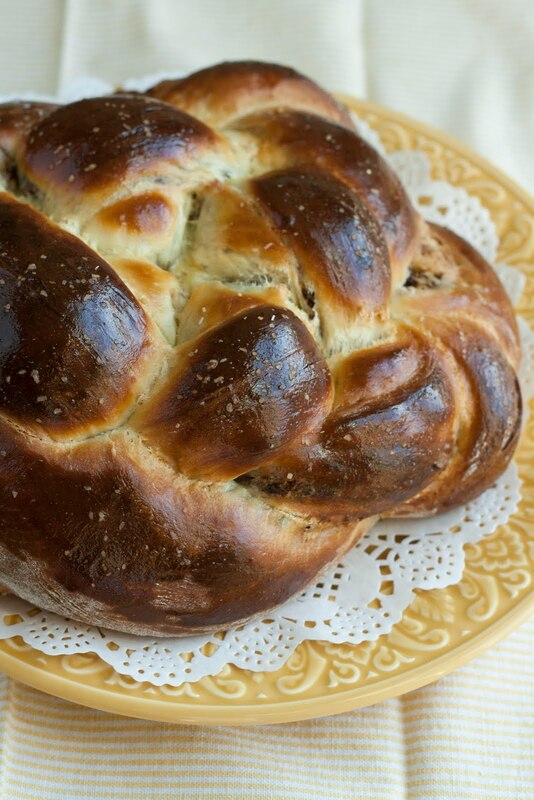 Your "bread month" might not have been overly bready, but this looks delicious! I've been meaning to do the 52 in 52 bread challenge myself--bake 52 loaves in 52 weeks. But I have a feeling as soon as I decide that this is it, this is loaf number 1, it'll be ages til I try loaf number 2. One day! I have to comment because you mentioned Small Plates and Sweet Treats....I won her book and I have not been able to put it down. It's kind of like one of those coffee table art books, but it's food!